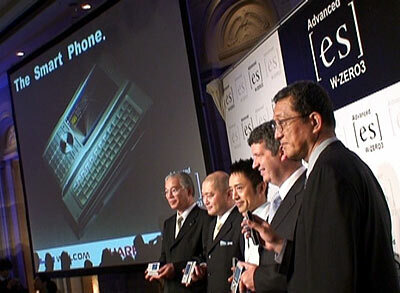 Willcom, Sharp and Microsoft held a press conference yesterday at the Okura Hotel to announce the new W-Zero3 ES smartphone. The 3rd model in their series from Sharp this latest unit weighs in at 157grams and measures just under 18mm thick. Boasting a 3.3 inch VGA (480×800) LCD touch-screen display and the so-called xCrawl jog dial with Windows 6 OS running on Marvells PXA270 520MHz processor and Wi-Fi enabled this device will be available on order here by the end of June. WWJ was on-hand for the event and will post video asap, more details after the jump. The input method of putting on the touch panel input and the usage in which the same QWERTY keyboard and liquid crystal screen as the same dial key as the cellular phone and the personal computer are operated directly together can be used properly. In addition, “Xcrawl (Exe crawl)” is installed as a central key that can instinctively manipulate the scroll of the screen and the selection of the cursor, etc.Ultimate operativeness was achieved. Microsoft Windows Mobile 6 is adopted in OS. There is interchangeability with the application for PC such as Word, Excel, PowerPoint, PDF, and Outlook, and it can enjoy taking out music and the animation to which it listens with PC in Windows Media Player 10 Mobile. Moreover, because the addition of the application is possible, it is customizable in the mobile device put together on my style. VGA (800×480 dots) wide liquid crystal of three inches for which the liquid crystal technology of Sharp was made the best use of was installed. It is possible to inspect it as few horizontal scrolls are also in the homepage for PC depending on high detailed liquid crystal and full browser “Microsoft Internet Exploer Mobile” excellent as for the visibility “Opera Mobile”. CMOS camera of effective pixel number about 1.31 million pixels is installed in the back of the main body. Taking a picture according to the purpose is possible according to the setting of seven taking a picture scenes. Of course, it corresponds to the animation taking a picture and the QR code. Moreover, the infrared rays communication function can be installed, and the data of the address book and the photograph be exchanged with the cellular phone corresponding to the infrared data communication. It is standard equipment as for wireless LAN function in accordance with IEEE802.11b/g. We can use it properly by additionally switching wireless LAN communication and the PHS data communication to the use scene. When service is used, “Wilcom wireless LAN option” that can be used in the coverage of wireless LAN service developing about 3,300 access points in 47 nationwide administrative divisions and “Hot spot” is recommended. It is an enhanced feature and an unlimited potential. The option to expand the possibility of Advanced/W-ZERO3[es] like 1Seg digital-tv (sale schedule in July, 2007), the Bluetooth adaptor (sale schedule in July, 2007), and the GPS unit (sale schedule in the autumn of 2007), etc. infinitely appears one after another. It can enjoy Advanced/W-ZERO3[es] by combining by one’s own style. The content service such as “W+Book” “W+Video” that can enjoy “W+Info” to which the hot poo etc. are automatically delivered with the photograph and a favorite comic and the movie can be used. Moreover, NAVITIME and GoogleMap, etc. to say nothing of the game and the online trade can be freely mastered.